The sacred, mist-shrouded forests of Te Urewera are just 30 minutes from Awakeri Hot Springs and Holiday Park. With a rich Maori history and stunning scenery and wildlife, the Te Ureweras offer a picturesque Bay of Plenty bush walk for guests at our Whakatane motel accommodation and Holiday Park. 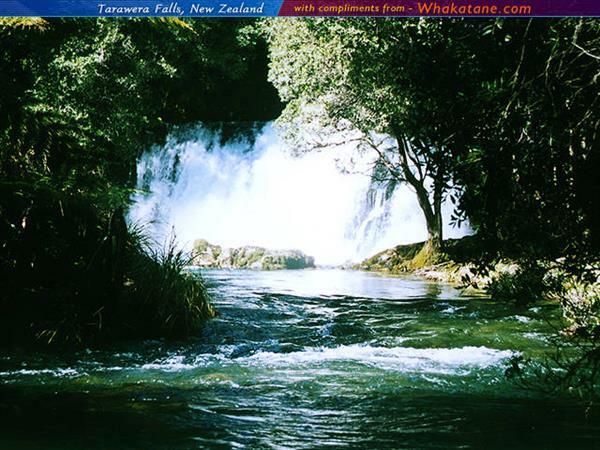 Remote, rugged and immense, Te Urewera contains the largest forested wilderness remaining in the North Island. The forest is famous for its crystal-clear lakes and rivers and its lush forested beauty. For centuries Te Urewera has been home to the Tuhoe people or the 'Children of the Mist'. Tuhoe traditions are strong and their links with this land run deep. In the southern part of the park lie two of the park's treasures, Lakes Waikaremoana and the smaller Lake Waikareiti. Waikaremoana was formed 2200 years ago by a huge landslide, which blocked a narrow gorge along the Waikaretaheke River and formed a lake up to 248 metres deep. All around the lake, misty mountains stretch off into the distance, cloaked in ancient podocarp and beech forests. There are more than 650 species of native plant present in the park. Much of the park is remote and not easily accessible. This has helped to protect some of the park's native wildlife and is home to Kiwi, Kaka (a large forest parrot), Falcon and the distinctive Whio / Blue Duck, to name just a few. Please visit the local Department of Conservation site for a full description of the park and the many things to see and do in the Eastern Bay of Plenty area. Hunting of introduced animals such as pigs, deer, goat and possum is allowed in Te Urewera (and encouraged, as these species cause significant damage to the park). Permits can be easily obtained from the Aniwaniwa Visitor Centre. Visit the Aniwaniwa Museum (in the heart of Te Urewera) to gain rich insight into local cultural and natural history. Whether you come to fish, walk or tramp, bird-watch or kayak you’ll want to come back time and time again to the magic of Te Urewera. Please contact Awakeri Hot Springs and Holiday Park for more information on accommodation for your Te Urewera experience! Short walks in the Te Urewera lead to sandy bays on Lake Waikaremoana at Whatapo Bay, Te Maraateatua Point and Te Whero Bay, and good views can be enjoyed from Lou's Lookout. Longer walks to Panekiri Bluffs and Ngamoko Trig are rewarded by extensive views over Lake Waikaremoana, Lake Waikareiti and the surrounding countryside. This is one of the best walks in the Bay of Plenty region. The walk to Lake Waikareiti not only gives access to the crystal-clear waters of this lake, but is equally one of the most beautiful forest walks in the Ureweras and an exciting thing to do during your stay in the Bay of Plenty. The forest is rich in native birds such as Tuis, Bellbirds, New Zealand pigeons,Parakeets, Kakas, Riflemen, Robins and Fantails. Other short forest walks include Tawa Walk and Black Beech Walk. Waterfalls are another distinctive feature of the Ureweras. The Hinerau's Track follows the Aniwaniwa River, passing a succession of waterfalls (the Aniwaniwa Waterfalls), including the Momahaki, Te Tangi o Hinerau and Bridal Veil Falls. Closer to the Visitor Centre the Papakorito Falls is a spectacular waterfall within easy access of the road. A round trip takes in the Onepoto Caves, a series of caves and overhangs resulting from the landslide that formed Lake Waikaremoana. On the Rangitikei side, near Galatea, a number of walks lead into the western part of Te Urewera. From the summits of Hikurangi and Maunga Tawhiuau the views reach far over the Ureweras, as well as south towards Ruapehu and Tongariro. Many tracks and routes lead deep into the Te Urewera, often following old Maori tracks. The renowned Lake Waikaremoana Track is a 51 km, 3 to 4 day tramp over a distinctive landmark, the Panekiri Bluff, and around the Western Lakeshore. It is one of New Zealand’s Great Walks, and offers idyllic scenery, plentiful bird life, and excellent trout fishing and hunting. A shuttle bus and boat service to the track entry / exit points operates from the camping ground on demand. Other tramping routes equipped with tracks, bridges and huts, and suitable for most trampers, include the Whakatane River and the Horomanga Valley. Many other routes are suitable for more experienced trampers only. They usually include rugged terrain and difficult river crossings, and require good navigational skills. A tent for an overnight stay is often necessary.